The Federal Reserve (Fed) releases the minutes from July Federal Open Market Committee (FOMC) meeting on Wednesday. Credit spreads are tighter. Commodity prices are firmer. More stocks are participating to the upside. Financial conditions within the banking system are improving. These are some of the “high frequency” items that are on the mend this year. As this happens, equity markets are performing better. 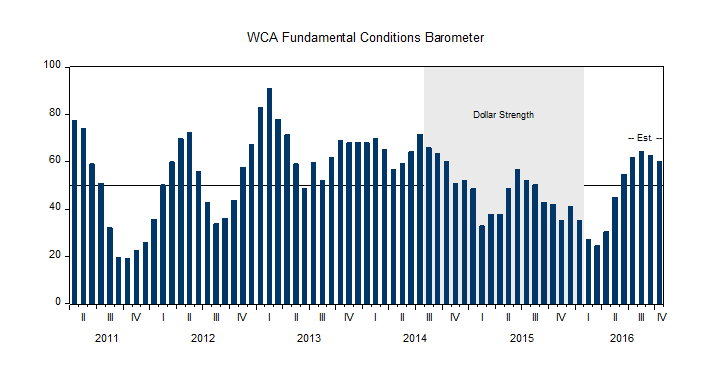 Our own WCA Fundamental Conditions Barometer (below) is telling a similar story. 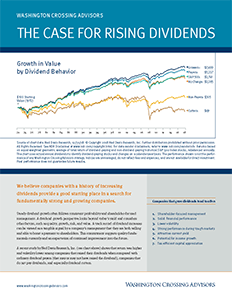 Around the time markets began to price in a less-hawkish Fed earlier in the year, conditions began to firm. Commodities ended their freefall. Survey measures of manufacturing activity started to improve. Earnings forecasts even got a small lift. Growth started to pick up. We think it is no accident that the improvement also coincided with a softening of the dollar. Starting back in 2014, the U.S. dollar began a 25% climb on a trade-weighted basis. The strong dollar pressured global trade and dampened growth, particularly outside the United States. It was a year ago that China announced a 2% devaluation to ease some of the pressure coming from a strong dollar. Global markets swooned in the weeks that followed. Job gains continue, and core price measures are creeping higher. There are only modest increases priced in to markets today. If the economy is, indeed, improving rapidly the dollar could easily strengthen again. For now, we are happy to see the economy picking up from its lumbering pace last winter. 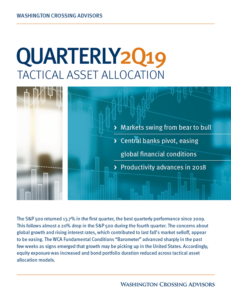 A 3-4% growth rate in the third quarter would mark a significant and welcome growth improvement. Before we sign off, we want to mention two less-followed numbers we got last week. According to the government, productivity turned negative in the second quarter, as unit labor costs rose roughly 2%. The lower productivity trend is a drag on growth, and the higher cost of producing a unit of output is a drag on profits. We expect these trends take time to reverse, and the productivity discussion will likely garner more attention. These trends are worth watching. Editors’ note: There will be no commentary next week.